I had a weird idea to make a plane that could drop fire retardant ( like baking soda) or water to put out small fires (not real fires just something like a few pieces of paper inside a trash can). I have thought of a couple of way to do this, one of them being to have a water bottle with a hole at the bottom that basically drops the fire retardant out the bottom of the plane when a servo pushes something like bomb bay doors open. The other is far more complicated but seems interesting to me. I would have a canister of pressurized air that fed into a small tube, this tube would lead through the fire retardant (in the water bottle) and would then go out the back of the aircraft. 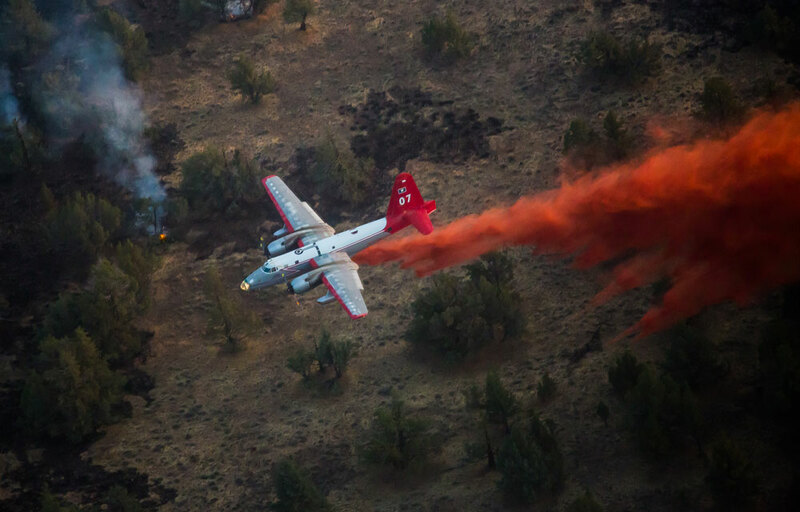 When a servo presses on the pressurized air canister "trigger" the air would shoot through the tube and would push the fire retardant out the back of the aircraft. Is this even possible? I don't really know but I am interested to find out. It would be a four engine prop plane. I have never used four motors on an aircraft and don't know how to wire it. Does one of you know if it is possible to use one battery for four motors? I would love to see other people do something similar so in that sense this is a build challenge, but i understand if you already have to much on your plate and just want to watch. Any ideas/advice is very appreciated regardless of how weird it might seem. Thank you for your time. Oh and i forgot to mention what i am thinking for the design of my aerial fire fighting plane. I was thinking the fuselage and tail of a c-119 flying boxcar, the wing of a antonov An 225-Mriya, and the engine and prop style of a C-130 Hercules. Sorry to be such a 'damp squib' but It sounds to me as if your design imagination is running away with you! Water is heavy and to be effective from a plane it has to dropped all at once so I would strongly suggest you experiment and perfect such a system on a simple single engine plane that you don't mind destroying. Only when you have a system that works every time and you have learnt about the effects on the plane of suddenly releasing a significant proportion of its weight should you even consider building specialised water bomber, let alone a multi engine one! I totally understand what you are saying. I will be using baking soda as it has fire retardant properties. I was just saying water as another option. The baking soda and drop system would be on the Center of Gravity which would help the weight difference. As for putting this system in a multi engine plane, i am specifically designing this plane to carry a small payload. Before i ever put the fire extinguishing system in the plane i would first perfect the system and before i even thought about putting it in the plane, i would fly and trim and tweak the plane to perfection. And you are probably right about my imagination but i am a very optimistic person and would love to have a go at it. Thank you for your input and advice! Thank you! so the main difference in his system (aside from the plane i would be using) is that his was out the back and gravity fed. Mine would either be gravity fed and through the bottom of the plane or pressure fed and out the back of the plane. I got the vertical stabilizers, tail booms, main fuselage, and wings done yesterday. Hoping to get the tail done today. I will post pictures when the build is complete. Here is the P2V I'm designing and building. I haven't had a chance to work on it for a while. The structure is pretty much complete, I still need to add the power pods and servo's. Then I was going to look into some way to rig up some bomb bay doors once I verified it was actually going to fly. My hometown is the HQ for these P2V Neptune slurry bombers, which is what inspired me. They were retired last year. Wow you are one step ahead of me! You will have to tell me how it goes and how the fire retardant drop works. If i come up with a system that works well and you are still working on yours i can tell you what worked and what didn't. I am glad that i found someone who is doing something similar to me! Good luck and happy building! I will have to buy a tx/rx with more channels before too long. I’m pretty sure mine is nearly as old as I am, and may even be illegal. I can’t find a whole lot of info on it, but somewhere I did find that if it doesn’t have some sort of gold sticker on it, it doesn’t meet some sort of 1992 radio act. I have a Futaba Attack-4. It really is an antique. Also the left stick is missing so I have a BBQ skewer stuck in there and a bunch of glue on it to build it up to a more comfortable diameter. I guess the post 1990 or 91 Futaba transmitters are FCC compliant but I can't find any date info on it. I am thinking about stepping up to a DX8e but I haven't done a ton of research yet. I'd like to keep my options open with more than 6 channels. Ya having more channels is helpful but i would honestly have to recommend the dx6e that is what I have and love it. 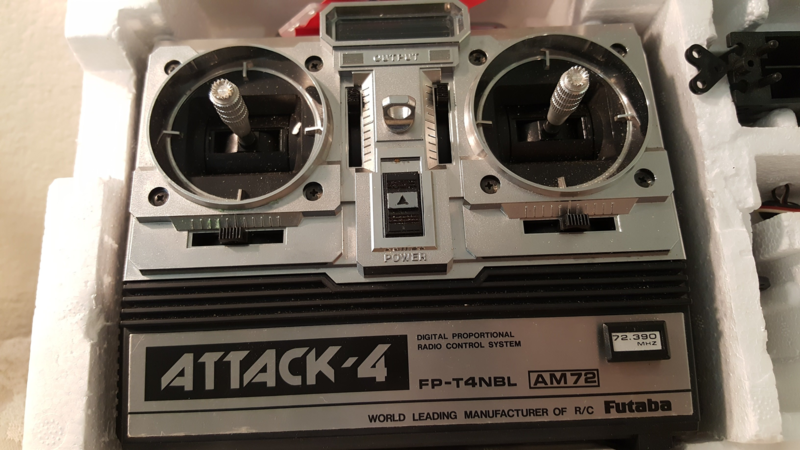 I considered getting a dx8e but after having the dx6e i realized that unless you intend to build insanely complex very very expensive models, you probably aren't gonna need more than a dx6e. That is just my opinion and of course it is your choice but that is just from my previous experience. How's your build coming? I finally ordered a twin power pack C for my P2V. I ordered a bunch of servo extensions and props also. The power pack is on back-order, I've only waited a month to order it and I'm already impatient in waiting for it to ship. 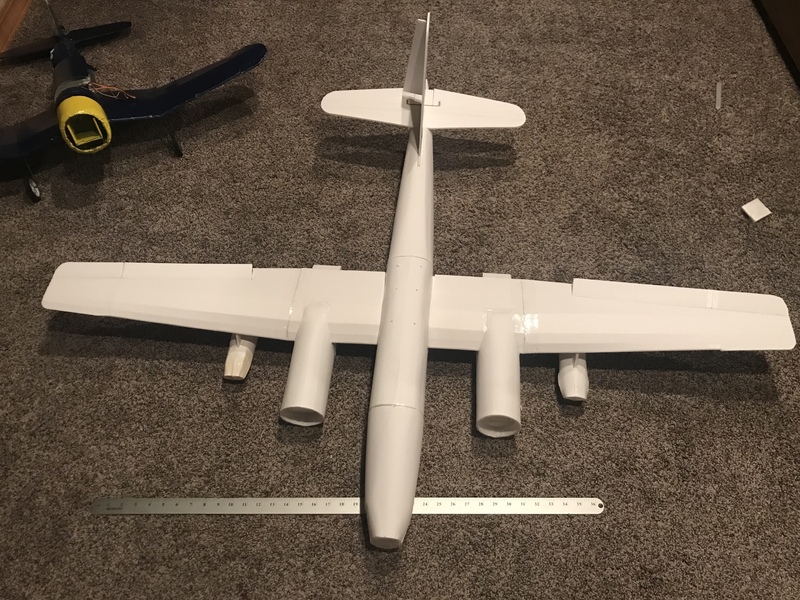 Its going well i finished the tail, wings, and fuselage. I am waiting for a friend to come over to help me solder the ESC to the motors (As i am not good at soldering.) I am having trouble figuring out how to attach the main wing. You know, if you wanted to do something like that, why not a water bomber. Build a seaplane, like a seaduck, and put a bomb bay that holds water (hint: make the doors open upwards so the doors add pressure to help with the water seal) and a retractable scoop to take it in, add a couple of extra vents near the top to blow-by extra water. Fly over your target, open doors, drop, land at a nearby pond. quorn has a point. Keep it simple, keeps it cheap, don't build the Mona Lisa, and use locally sourced stuff. Building stuff to carry weight gets real cheap when home depot is your hobby store. Take some half inch pink foam or blue dow foam, make yourself a drake seaplane fuselage and tail feathers. Use some FT foam to make up a wing with a bit more span, install a pair of engines for more power and learn a bit from STOL aircraft design. Use a clark Y airfoil or something with good lift capabilities, if you're not a fan of my suggestion of airfoil, do your own research. Add some flaps and a horner wingtip and you're golden. Or just build a Seaduck but bigger (from personal experience, its not the easiest task to use a different foam to try to upscale a seaduck. You've probably noticed i keep saying bigger. A bigger aircraft will generally have larger payload capacities, i probably wouldnt suggest loading a stock sized Drake or Seaduck with enough retardant to put out anything more than a birthday cake. If you want some help, let me know, i have a CNC machine and would be happy to help out with design or just cutting some airfoils once i start gearing up my own winter builds after christmas. I thought about that but water is much heavier and i want this to be my workhorse plane that can do anything. I am using four blade props and four 1350kv motors swinging four blade props. the fuselage is 50 inches and the wing is 60 inches. Do you think that is enough power? I mean, a flat-bottom seaplane can do just about anything. Look at the seaduck or polaris, they get off anything but concrete, and a good set of retracts stowed in some sponsons (see the Icon A5) would fix that. How big of props are they, what are the specs on the motor (diameter, link if you have one to motor listing). What are you thinking for the airfoil an engine placement? Here are the motors specs. I will be using four of these with a 3200mah 4S battery. The engines will be in four different "power pods" similar to the FT ones, just longer. they will be mounted under the wings. Any idea how to mount the wings would be very appreciated. Thanks for your help! Whilst your chosen props, motors and battery will work it will be an inefficient high revving small prop layout and 4 motors will work your chosen battery pretty hard giving about 3 minutes at full power. Not ideal for a 'do anything' plane. Just one bigger motor driving a single larger 2 blade prop could easily generate the same thrust level and likely only need about half the amps to do it. Less amps = longer flight!